Paineau, Erwan Amara, Mohamed Salah Monet, Geoffrey Peyre, Véronique Rouzière, Stéphan and Launois, Pascale 2017. Effect of Ionic Strength on the Bundling of Metal Oxide Imogolite Nanotubes. The Journal of Physical Chemistry C, Vol. 121, Issue. 39, p. 21740. Thill, A. 2016. Nanosized Tubular Clay Minerals - Halloysite and Imogolite. Vol. 7, Issue. , p. 223. Fujikura, Kie Maeda, Hirotaka Obata, Akiko Inukai, Keiichi Kato, Katsuya and Kasuga, Toshihiro 2014. Preparation and Rheological Characterization of Imogolite Hydrogels. Journal of Nanomaterials, Vol. 2014, Issue. , p. 1. Karan, Santanu Wang, Qifeng Samitsu, Sadaki Fujii, Yoshihisa and Ichinose, Izumi 2013. Ultrathin free-standing membranes from metal hydroxide nanostrands. Journal of Membrane Science, Vol. 448, Issue. , p. 270. Baroña, Garry Nathaniel B. Lim, Joohwan Choi, Mijin and Jung, Bumsuk 2013. Interfacial polymerization of polyamide-aluminosilicate SWNT nanocomposite membranes for reverse osmosis. Desalination, Vol. 325, Issue. , p. 138. Baroña, Garry Nathaniel B. Choi, Mijin and Jung, Bumsuk 2012. High permeate flux of PVA/PSf thin film composite nanofiltration membrane with aluminosilicate single-walled nanotubes. Journal of Colloid and Interface Science, Vol. 386, Issue. 1, p. 189. Carraher, Charles E. and Pittman, Charles U. 2009. Ullmann's Encyclopedia of Industrial Chemistry. Li, Lijuan Xia, Yueyuan Zhao, Mingwen Song, Chen Li, Jiling and Liu, Xiangdong 2008. The electronic structure of a single-walled aluminosilicate nanotube. Nanotechnology, Vol. 19, Issue. 17, p. 175702. 2006. Conducting Properties of Polypyrrole Coated Imogolite. Bulletin of the Korean Chemical Society, Vol. 27, Issue. 11, p. 1815. Carraher, Charles E. and Pittman, Charles U. 2000. Ullmann's Encyclopedia of Industrial Chemistry. Koenderink, Gijsberta H Kluijtmans, Sebastiaan G.J.M and Philipse, Albert P 1999. On the Synthesis of Colloidal Imogolite Fibers. Journal of Colloid and Interface Science, Vol. 216, Issue. 2, p. 429. He, Ming and Horikawa, Yukiya 1997. Electrokinetic properties of variable charge clays in the presence of an anionic xanthan polysaccharide and inorganic electrolytes. Soil Science and Plant Nutrition, Vol. 43, Issue. 2, p. 307. Yu, Zengshou Warner, Jeffrey A. Dahlgren, Randy A. and Casey, William H. 1996. Reactivity of iodide in volcanic soils and noncrystalline soil constituents. Geochimica et Cosmochimica Acta, Vol. 60, Issue. 24, p. 4945. Shindo, Daisuke 1995. Recent Progress in Materials Analysis by Transmission Electron Microscopy. Materials Transactions, JIM, Vol. 36, Issue. 4, p. 473. Shindo, Daisuke Aita, Saburo Park, Gyeong-Su and Sugimoto, Tadao 1993. High-Voltage High-Resolution Electron Microscopy on Thin Films of Monodispersed Pseudocubic and Peanut-Type Hematite Particles. Materials Transactions, JIM, Vol. 34, Issue. 12, p. 1226. Barrett, Shaun M. Budd, Peter M. and Price, Colin 1991. 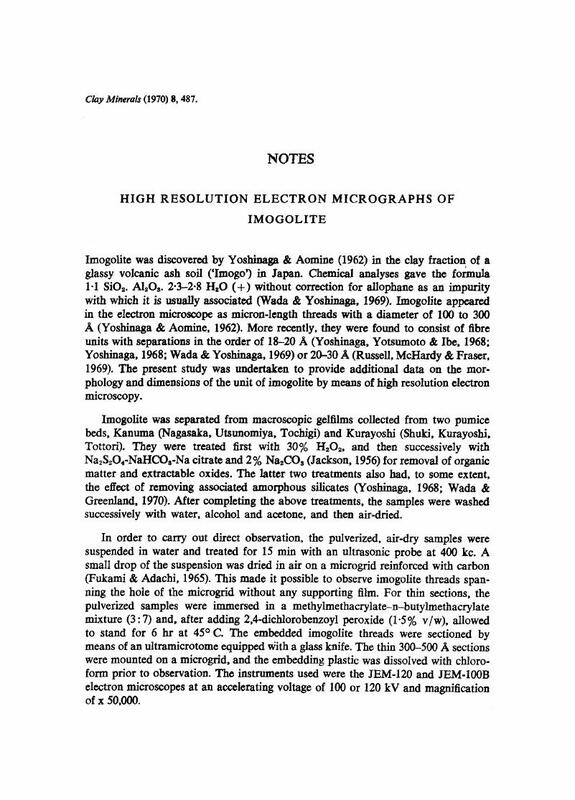 The synthesis and characterization of imogolite. European Polymer Journal, Vol. 27, Issue. 7, p. 609. 1990. Clays, Muds, and Shales. Vol. 44, Issue. , p. 723. Kotlyar, L.S. Kodama, H. and Ripmeester, J.A. 1990. Possible identification of poorly crystalline inorganic matter present in Athabasca oil sands. Applied Clay Science, Vol. 5, Issue. 1, p. 1. Henmi, T. Nakai, M. Seki, T. and Yoshinaga, N. 1983. Structural changes of allophanes during dry grinding: dependence on SiO2/Al2O3 ratio. Clay Minerals, Vol. 18, Issue. 01, p. 101. Furami, A. & Adachi, K. (1965) J. Electron Microsc. Chiba Cy. 14, 112. Jackson, M.L. (1956) Soil Chemical Analysis - Advanced Course, p. 31. Published by the author, Madison, Wisconsin. Russell, J.D., Mchardy, W.J. & Fraser, A.R. (1969) Clay Miner. 8, 87. Wada, K. & Greenland, D.J. (1970) Clay Miner. 8, 241. Wada, K. & Yoshinaga, N. (1969) Am. Miner. 54, 50. Yoshinaga, N. (1968) Soil Sci. PI. Nutr. Tokyo 14, 238. Yoshinaga, N. & Aomine, S. (1962) Soil Sci. PI. Nutr. Tokyo 8 (3), 22. Yoshinaga, N., Yotsumoto, H. & Ibe, K. (1968) Am. Miner. 53, 319.